Located at W. Hwy 76 in Branson, Bigfoot on the Strip is a great place to enjoy unique outdoor fun in Branson as it offers a variety of attractions, all themed around Bigfoot. The facility is designed to appeal to all ages and abilities. This huge facility features both indoor and outdoor activities including the Big Foot Discovery Expedition, Big Foot Action Tower, Big Foot Adventure Golf, Yeti Play Zone & Money Jump, Bigfoot’s Arcade, Bigfoot 8Di Leadslinger Cinema, and Bigfoot Food Truck Dining Park. 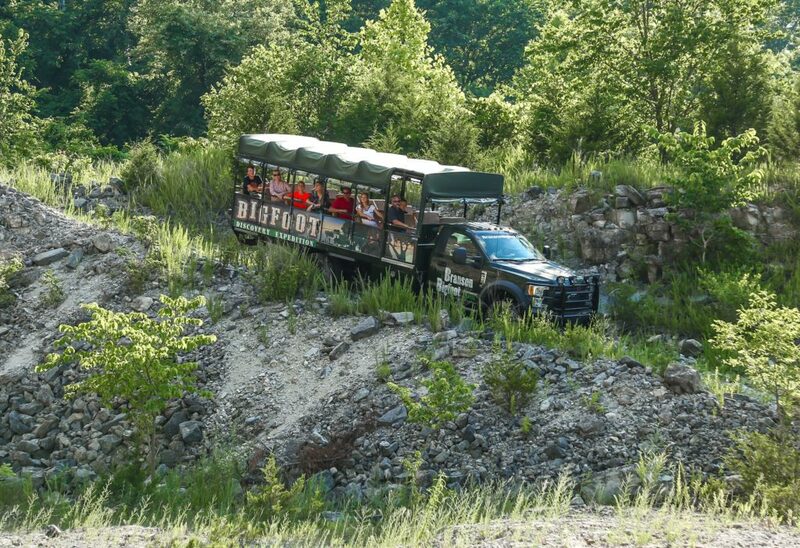 Bigfoot Discovery Expedition is the first of its kind where you will join Bigfoot Research team and board safari trucks for a visit to Bigfoot Farms. You will see the beauty of the Ozark Mountains and interact with mystical Scottish Highland Cattle on a farm, featuring cows from the largest Scottish Highland producer in the Midwest. The one hour and twenty minute tour will take you off the road and over rugged terrain with twists and turns and a few surprises that will make you move on the edge of your seat. The Big Action Tower, standing at over 200 feet, is one of the newest attractions in Branson that features two individual adrenaline-pumping rides. The Gravity Bomb is a 200 feet free fall ride that seats up to 8 riders. This is the only drop ride in the world that allows riders to experience a true free fall. The ascent to the top allows riders to see panoramic views of Branson area. This is a heart-pounding adventure that is a must-try ride when you’re in the area. The Super Sling is another great attraction in the Big Foot that allows two riders to climb onto a seat that resembles a saddle, the riders are seated back to back and launched straight up into the air. Bigfoot Adventure Golf is a mini-golf adventure that will impress you over the 18-hole course. You can walk through a decorated cave with glow in the dark and blacklight painting for bats, a wolf, and all other kinds of creepy-crawlies. Yeti Play Zone & Monkey Jump features challenges and obstacles that house a series of underground tunnels, climbing towers, a spiral slide, viewing areas for the parents, a Yeti Treehouse, and even a jump tower that allows visitors to Monkey Jump 10 feet off the tower and onto a massive inflatable landing mat. Bigfoot Arcade features games that are new to the area. This makes the arcade one-of-a-kind attraction in Branson that is housed at Bigfoot on the Strip. Photo booths, claw machines, skee-ball, and classic arcade games will keep you highly entertained all day. Bigfoot’s 8Di Action Ride is another thrilling adventure that provides players with an amazing and totally immersive interactive gaming experience, complete with 8D interactions. With multiple movies to choose from, you will be able to chase villains in the Wild West and help Bigfoot escape. If you want to experience a unique outdoor fun in Branson, try some of the newest adventures at one-of-a-kind attraction in Branson, Bigfoot on the Strip.